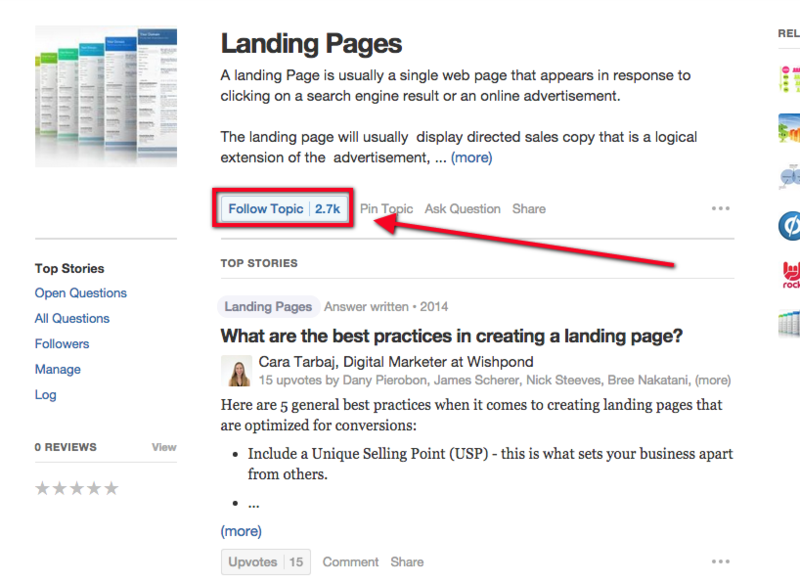 Quora is a great way to drive traffic to your website. We’ve been using the Q & A community to drive traffic to our site for about 3 years now. In the last month alone, I gained 23,000+ views on my Quora answers. 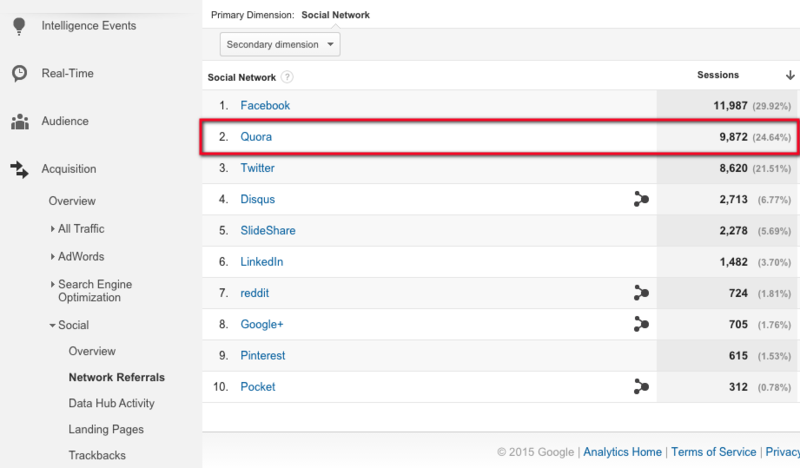 In this article I’m going to give you the 4-step strategy we use that’s makes Quora the second biggest social referrer of traffic to our website. 1. Choose a blog post to use as your answer and a link back that has multiple examples or strategies. 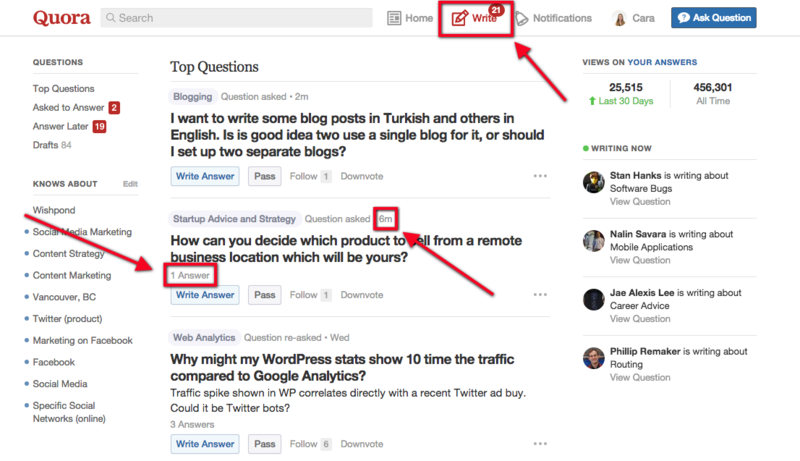 The best place to find content to link to in your Quora answers in on your blog. Linking to blog posts in your answers will get traffic to your site and prove your business as a thought leader in your industry. 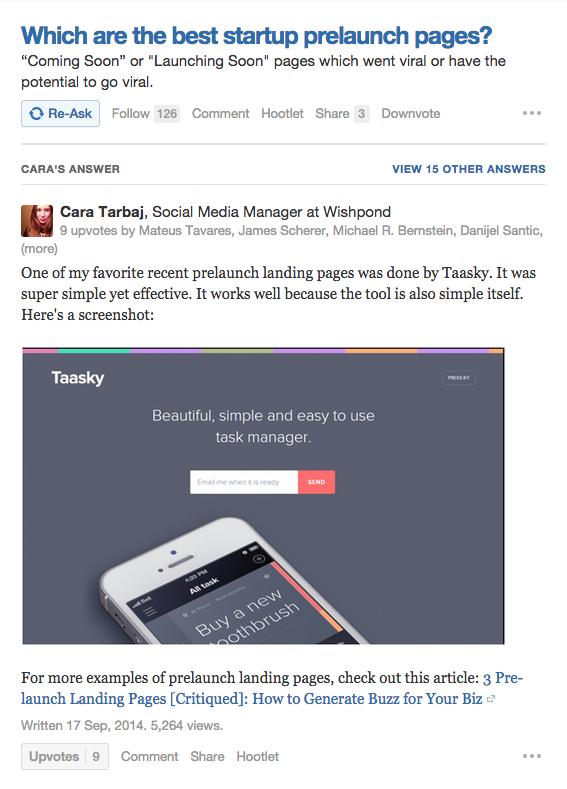 Pick an article with multiple examples and strategies so Quora users have a reason to click the link you provide to your article in the answer. Make sure your blog post can answer a question your target market might have. This is a lot less salesy and provides more value than just a link to your product or service page. 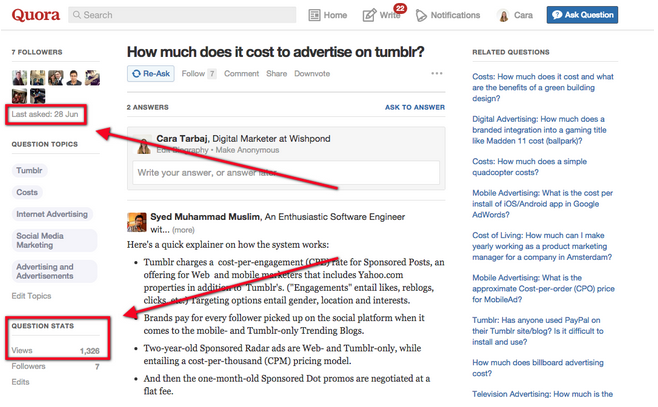 It’s important not to treat Quora as a sales platform. Often when people ask Quora questions, they want an answer that leads to an action, whether or not it’s rhetorical. This will also open up more questions for you to answer and ensures that you’ll be providing value. All three of those questions can be answered with actionable strategies. For instance, this Quora answer is answered with actionable strategies and is our second biggest source of social referral traffic: 60 Simple Ways to Increase Your Twitter Followers. A lot of the time people on Quora will ask for examples of all sorts of topics so they can understand something better. One of our example-providing answers became our number one source of social referral traffic. This is the specific example article here: http://blog.wishpond.com/post/83625975652/3-pre-launch-landing-pages-critiqued-how-to-generate. 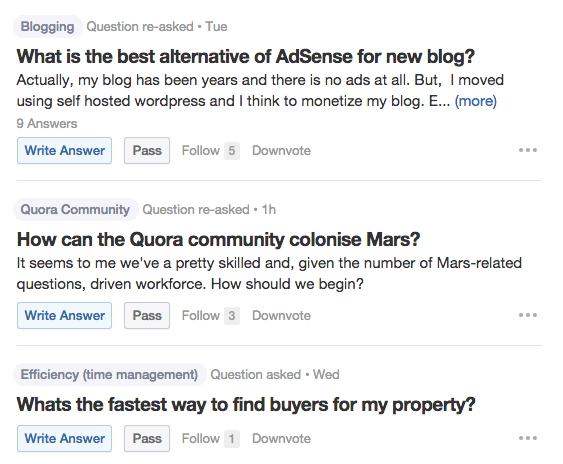 There are a few different ways to find the right questions on Quora. Use the search bar. Search short phrases and keywords that relate to your article (don’t use long sentences as they’re not good for getting the results you want). For example, I searched “pre-launch landing page” when I found our top traffic-driving question (which I’ll talk more about below). Browse/follow topics. Each topic has a set of “stories” which are top answers at the time. Follow people in your industry. Then browse your home feed for an assortment of questions answered by people you follow. For browsing the most recent questions, you will have to follow some topics first. Use the search bar at the top of the page to find topics relevant to your industry. You will know a search term is a topic as it will say so on the right hand side. Once you click on it, you’ll be brought to the topic page, where you can click the “Follow Topic” button. After following at least a few relevant topics, you can find the most popular recent questions under “Write” in the navigation bar at the top of the page. They won’t be sorted in terms of most recent, but each question has a time that it was posted in the description. Look for ones that are no more than an hour old with 0 to 5 answers. A question that’s at least a week old with 1,000 views or more is a good place to start. 1,000 views ensures that the question is popular enough within the Quora community - the more people that view the question, the more exposure your answer will get . Here’s one that’s perfect: It was asked a little over a week ago and has 1,326 views. In the picture below I’ve pointed out both the date it was asked and the views on the question. Unfortunately Quora doesn’t allow for any kind of date or view counter filtering, so you’re going to have to spend a bit of time searching on your own. But the return on your time invested is well worth it. And once you’ve started to answer a few questions in your niche on Quora, people will start asking you questions that they want answered. You’ll see this in the same section under ‘Asked to Answer’ (in the sidebar). Note: Quora is like content marketing: you can’t just respond to one answer or post one article and expect to see results. 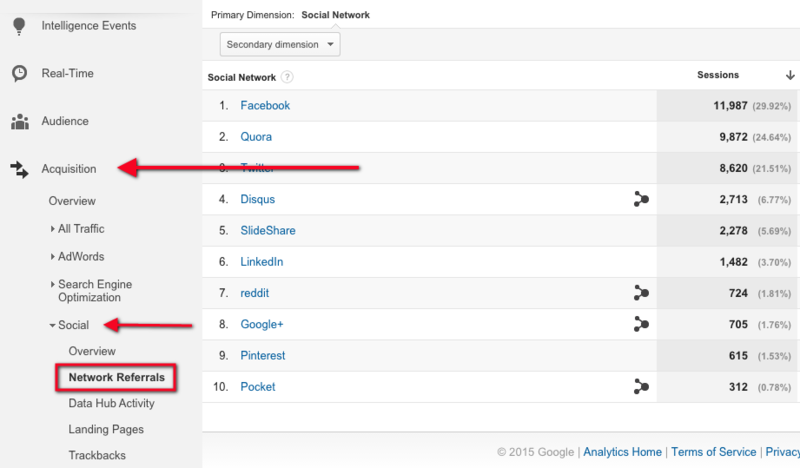 If you refer to the total traffic we get from Quora, you’ll see that our top answer only drives a fraction of the traffic we get from the site. Now that you’ve found the right question, you can start crafting the right answer. This Quora answer refers more traffic to our website than any other answer we’ve posted. So what makes this answer so special? In this answer, I could have easily pointed to our landing page builder. But instead, I stuck close to the question asked and provided an example of exactly what they were looking for. I gave a brief explanation of why I thought Taasky’s landing page was the best, and simply linked to the material at the end of the post in a suggestive (not aggressive) way. As I mentioned above, I included one example of a pre-launch page that I thought was great. I didn’t include ALL of the examples, so it gives readers a reason to click the article link I’ve provided at the end of the answer. In this answer I’ve voiced that Taasky’s pre-launch page is my favorite as opposed to the best as asked for in the question. This adds a more personal element to your answer. Try using, “I” “my” and “me” when appropriate in your answers. Images can really bring life to a wall of text. Quora doesn’t have a lot of graphics and images like other websites, so whenever you get the chance to throw a graphic, picture, or screenshot in, give it a try. Note: Do not stray from the specific topic of the question asked. For example, if someone is asking you what homemade recipes to feed their cat, do not trail off into the type of kitty litter they should use. Irrelevant information is not well-received on Quora. The only exception to this rule is voicing your opinion if you disagree - although you should definitely have a valid argument to go with any statement. Now that I’ve shown you how we drive traffic to our site with Quora, I’ll show you how we track the results (ROI) of our Quora answers. Start by opening up your Google Analytics account and go to the “Reporting” tab. You should see Quora on the list of Social Networks. Once you click on Quora, you’ll see a page like this one below with the list of pages on your website and the traffic that comes from Quora. If you click on a link, Google Analytics will show you the exact URL on Quora that drives the traffic to that specific page. 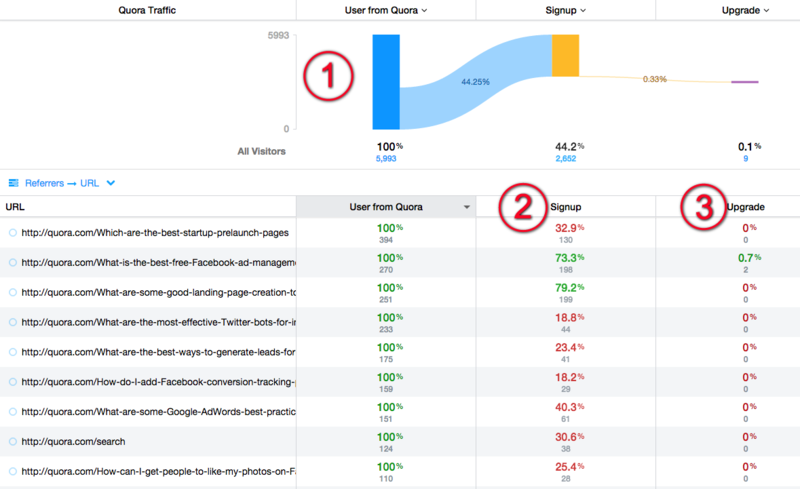 This is the biggest referrer of traffic to our website from Quora: Which are the best startup prelaunch landing pages? We know this traffic is actually reading the article because the average time they spend on the page is 6 minutes and 21 seconds. To delve deeper into the numbers, we use an analytics tool called Woopra to track our signups and upgrades from Quora. Funnel: This funnel is a visualization of the process users go through from Quora answer to upgrades on our blog. 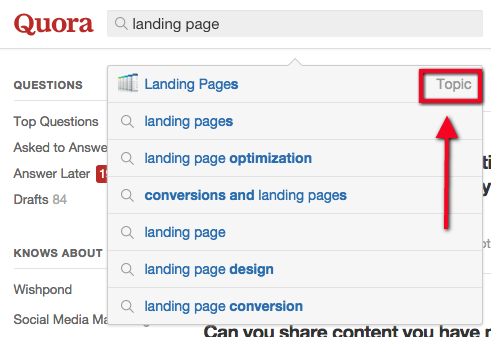 Signup: This shows us the conversions we get from our Quora answers. It shows us the percentage of our traffic that signs up for a free trial after visiting our blog. It also tells us the exact number in grey below the percentage. Upgrade: The upgrades are the number of people that sign up for a paid plan with us. Like signups, it details the percentage and the exact number. I hope this article has encouraged you to start answering questions on Quora, or at least improve your answering method to benefit your business. It’s important to keep in mind that you shouldn’t answer all Quora questions in this format. This is definitely an important strategy to implement, but it shouldn’t be abused - don’t always link your answers back to your business. Always try to be helpful on Quora! 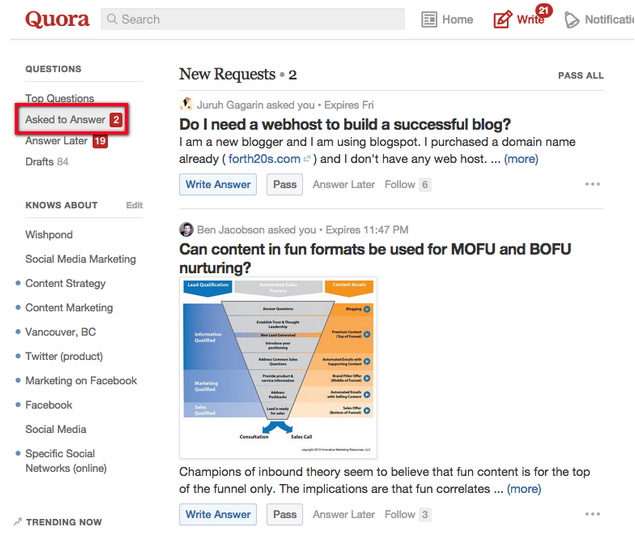 Have you already started using Quora to further your business? Have you seen success with it or not? Let me know in the comments below.